A new image from NASA's Curiosity Mars rover is the first ever from the surface of Mars to show an asteroid, and it shows two: Ceres and Vesta. These two -- the largest and third-largest bodies in the asteroid belt between Mars and Jupiter -- are the destinations of NASA's Dawn mission. Dawn orbited Vesta in 2011 and 2012, and is on its way to begin orbiting Ceres next year. Ceres is a dwarf planet, as well as an asteroid. A new image from NASA's Curiosity Mars rover is the first ever from the surface of Mars to show an asteroid, and it shows two: Ceres and Vesta. These two -- the largest and third-largest bodies in the asteroid belt between Mars and Jupiter -- are the destinations of NASA's Dawn mission. Dawn orbited Vesta in 2011 and 2012, and is on its way to begin orbiting Ceres next year. Ceres is a dwarf planet, as well as an asteroid. Three square insets at left show Phobos, Jupiter and Saturn at exposures of one-half second each. 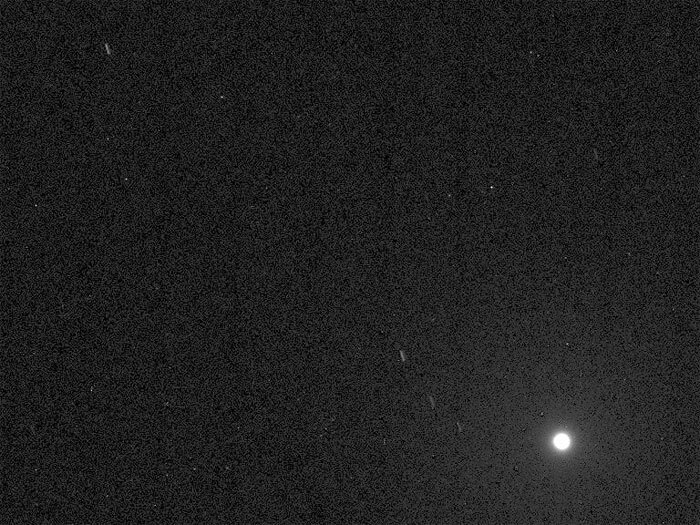 Deimos was much brighter than the visible stars and asteroids in the same part of the sky, in the main image. The circular inset covers a patch of sky the size that Earth's full moon appears to observers on Earth. At the center of that circular inset, Deimos appears at its correct location in the sky, in a one-quarter-second exposure. 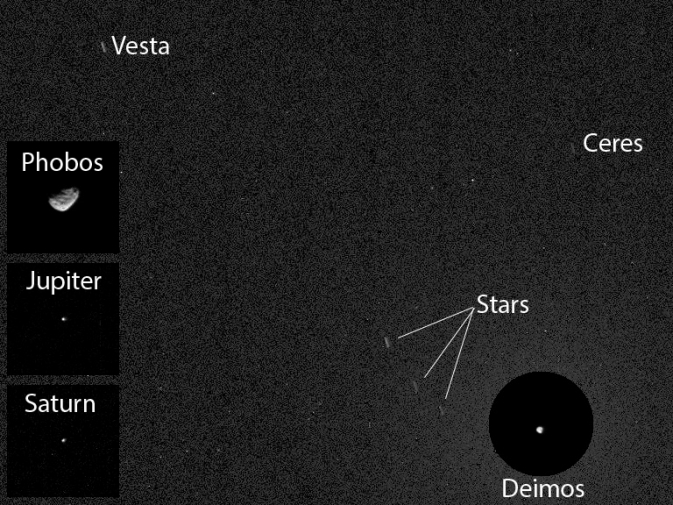 In the unannotated version of the 12-second-exposure image, the brightness of Deimos saturates that portion of the image, making the moon appear overly large. NASA's Jet Propulsion Laboratory, a division of the California Institute of Technology, Pasadena, manages the Mars Science Laboratory Project for NASA's Science Mission Directorate, Washington. JPL designed and built the project's Curiosity rover and the rover's Navcam. "This imaging was part of an experiment checking the opacity of the atmosphere at night in Curiosity's location on Mars, where water-ice clouds and hazes develop during this season," said camera team member Mark Lemmon of Texas A&M University, College Station. "The two Martian moons were the main targets that night, but we chose a time when one of the moons was near Ceres and Vesta in the sky." Ceres and Vesta are much larger and farther from Earth's orbit than the types of near-Earth asteroids under consideration for NASA's asteroid initiative. That initiative includes two separate, but related activities: the asteroid redirect mission and the grand challenge. NASA is currently developing concepts for the redirect mission that will employ a robotic spacecraft, driven by an advanced solar electric propulsion system, to capture a small near-Earth asteroid or remove a boulder from the surface of a larger asteroid. The spacecraft then will attempt to redirect the object into a stable orbit around the moon. Astronauts will travel aboard NASA's Orion spacecraft, launched on the Space Launch System rocket, to rendezvous in lunar orbit with the captured asteroid. Once there, they will collect samples to return to Earth for study. The grand challenge is a search for the best ideas for finding asteroids that pose a potential threat to human populations, and to accelerate the work NASA already is doing for planetary defense.